This was less easy than everyone had led me to believe, mostly because the instructions were not detailed enough. 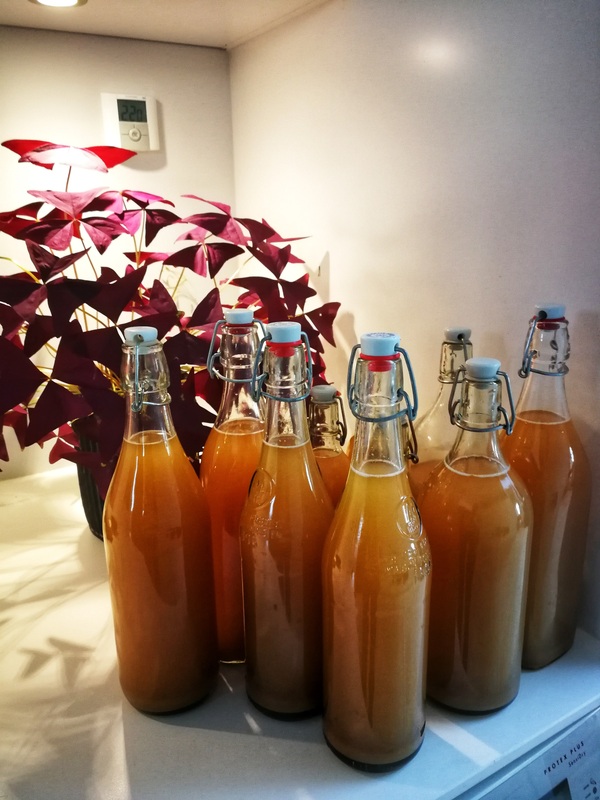 I started off with 8 liters of ginger beer and it fermented for two days in my parents’ bathroom along with my dad’s newest batch of home-brewed beer. 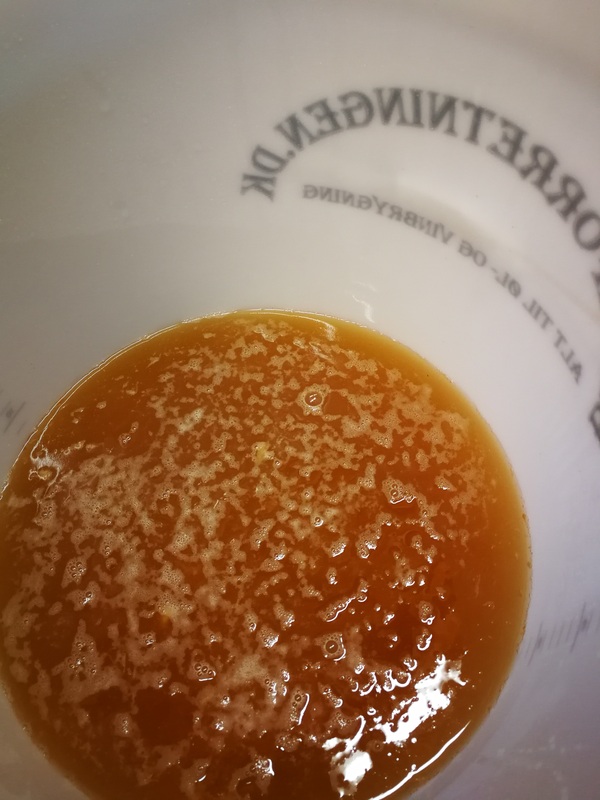 I am pretty sure I had added too much yeast to the mix (using ale yeast) but the taste was good before I bottled it last night – just a tad bit yeasty. 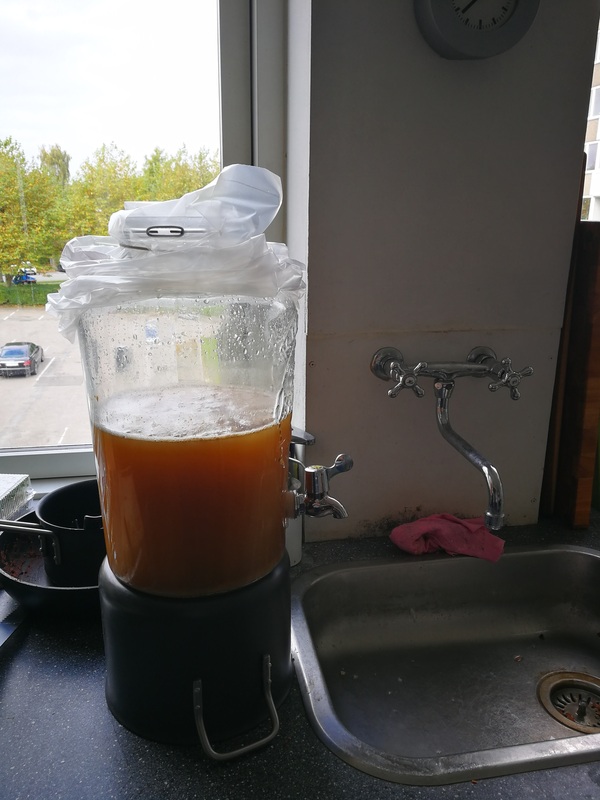 Sadly I had not heeded the advice everyone gave of using plastic bottles… I bottled the stuff (all of it – nobody thought it a good idea to mention not to leave in the dregs), and per the recipe I let it sit at room temp for a few hours (overnight, since that was how the timeline worked out). At 5 am I woke up for no particular reason and went to the bathroom where the bottles were located and found glass and ginger beer all over the floor. As I started to clean it up, two more bottles exploded. Ginger beer and glass were everywhere. I burped the rest of the bottles (which overflowed like crazy) and put them into the bathtub while cleaning up. Once I was done I poured everything into my lemonade container to let the dregs settle out of it. Once it was settled most of the yeast taste was gone, so they could get re-bottled. This afternoon I re-bottled the stuff, this time without the dregs, into plastic bottles. Now they are sitting on the counter waiting to re-carbonate before they go in the fridge. Hopefully that is the last of the messes. Next time I am trying this without yeast but using ginger to start off the fermentation and carbonation. It was a mess, but I am defiantly doing this again! 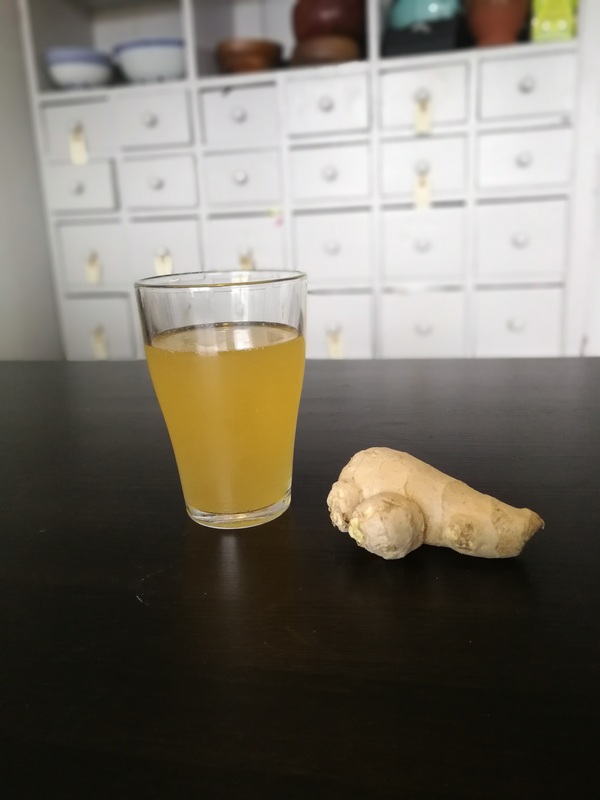 Edit: Today the ginger beer is cold from the fridge and it tastes quite good. It got a slight smell of yeast, but it is gone from the taste. The carbonation really worked – it now has bobbles like a champagne does, not like a modern soda. The taste is gingery and refreshing. I am quite pleased with the finished product. But what a mess. After I drank all of the ginger beer and loved it, I decided to give give it another go. This time around I had ordered champagne yeast from a website and decided to try to see if that would help the yeast flavour to go away. I pretty much used the same recipe but dramatically reduced the amount of yeast and brewed it in my own kitchen this time around. The brewing went well, however the yeast didn’t want to start working… It just didn’t start to bobble. 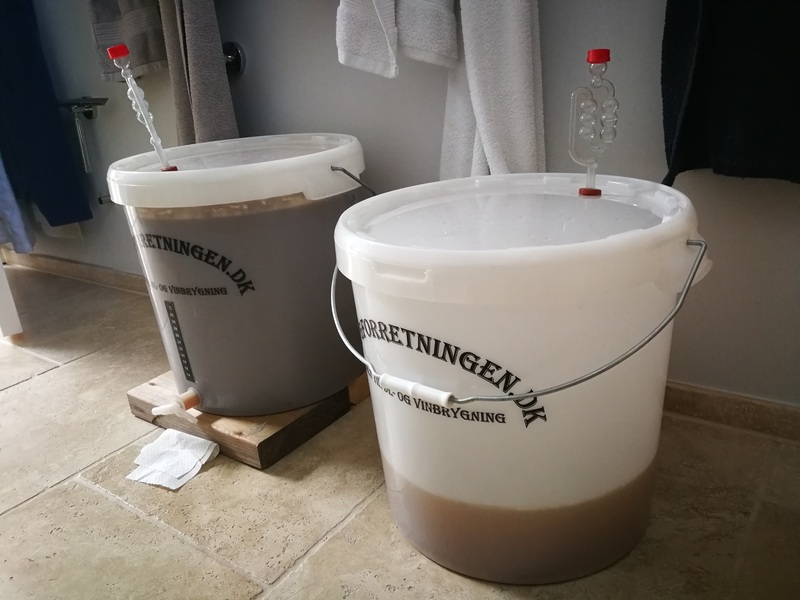 I figured that my kitchen was properly too cold, so I just let it sit longer… so instead of two days the fermentation took more than a week. I kept tasting it to check how the sugar level was – it just kept being too sweet. 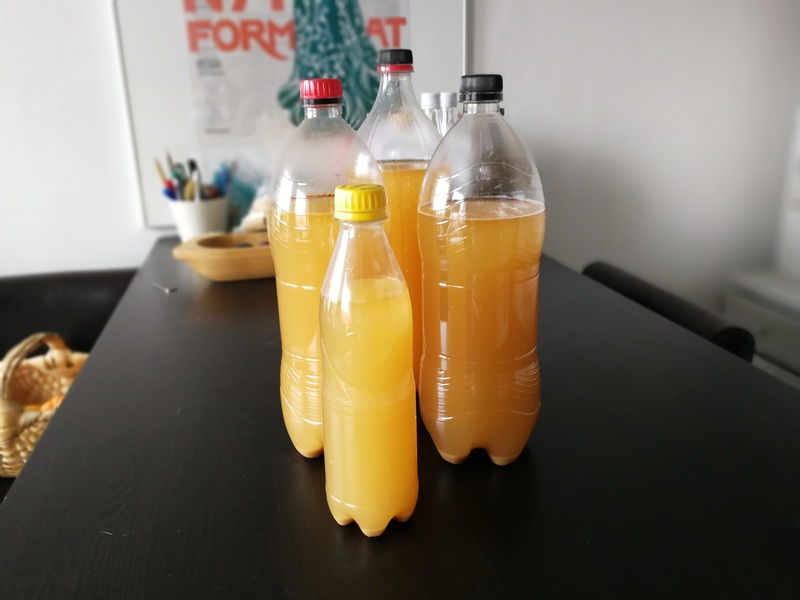 After about 10 days and much added ginger, the sugar level reached something that tasted like ginger beer and not like nasty sugar water, so I bottled it and put the bottles next to the radiator in the living room. After about a day I had nice and carbonated ginger beer. I put it in the fridge and as soon as it cooled I tasted it. This batch was carbonated, gingery and entirely without any yeast taste. Success. As soon as I have a recipe that works without too much fiddling I will share it with you! First try at bottling the stuff. The glass bottles are very likely to shatter and that is a mess! The finished brew, waiting to carbonate on the counter. The handy thing about plastic bottles is that you can feel when the carbonation is done by touching the bottle. If it is hard, then its done – simple as that. The finished ginger beer bobbles a la a champagne and a strong, but not overpowering, ginger taste. It is quite refreshing. Tastes great in a dark’n’stormy.